Part 1 of a three-part learning series: Understanding and Selecting IAM for Cloud Services. If your organization has any interest in increased productivity, enhanced security, or reduction of support costs, a serious evaluation of Single Sign-On solutions is absolutely essential. Learn how you can tackle the complexity of user access to cloud, web and internal applications and manage single sign-on, access control, account provisioning, and audit reporting under one roof. IT departments at schools across the country are challenged with on boarding thousands of new students and faculty users to internal and cloud applications each year. Furthermore, they are faced with a number of government compliance regulations, user privacy concerns and tasked with providing the most seamless learning experience possible. Add to this the expectation of application access from any mobile device and it becomes even more difficult to control which users have access to what applications and resources. That’s where Identity as a Service (IDaaS) comes into play. Watch this video from Symplified on how to seamlessly connect users and applications located on-premises or in the cloud, with a single sign-on. With employees working in the cloud and bringing their own devices, IT is faced with the challenge of balancing user access controls and user experience. In 45 minutes, learn how an identity-based security model for mobile users can protect cloud apps and data, provide universal coverage for all mobile platforms, and enable single sign-on from any mobile device to all the information resources business users need. Join Darren Platt, Symplified CTO and co-author of SAML and Lincoln Cannon, Director, Sales and Marketing Technology for Merit Medical, as we discuss the crucial role a centralized identity service plays to ensure both end-user productivity and IT efficiency. help any IT department harness the complexity of the cloud and put it to work for the organization. 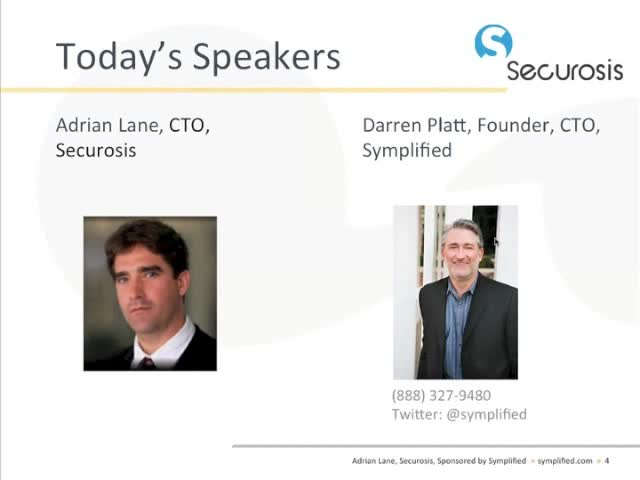 This webcast will examine how Symplified’s solution prevents side door access, and is based on a White Paper which will be distributed to all attendees.